Shooting my first big game animal is a day I won’t soon forget. And, sharing that day with the people in my life who matter most made it that much more special. For as far back as I can remember, hunting big game has been a desire of mine. As a young girl I tagged along with my Grandpa each year as he hunted the Interstate Unit in south-central Oregon. We’d load into his Jeep wrangler, him with his coffee, me with my hot chocolate and I would dream of the day I’d have a tag of my own. I loved the chill in the air, the multi-colored leaves and the fresh smell of dawn. 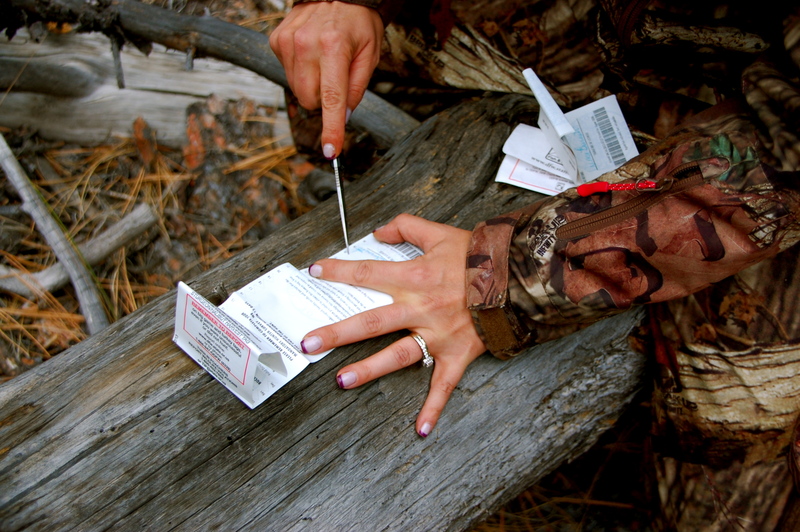 All of it signaled the arrival of fall, which to a hunter means one thing… deer season is here. 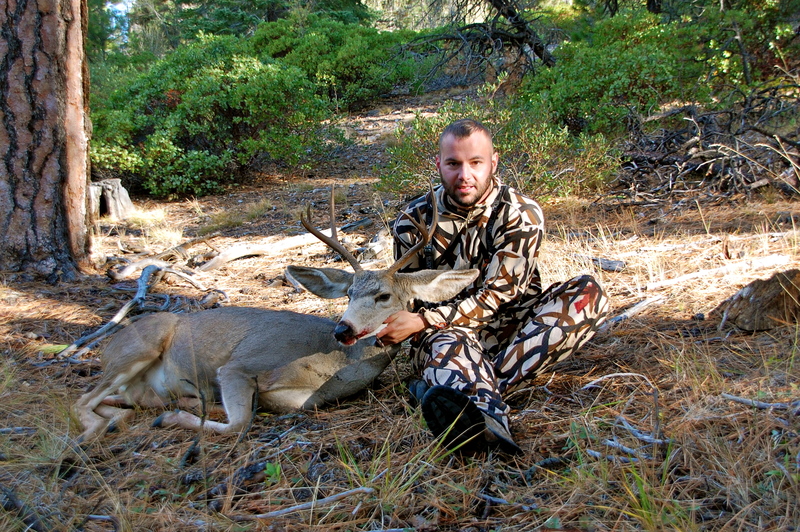 Well, in September of 2013, I set out to kill a mule deer buck. And, let me just tell you, the expectations I’d set for myself were very low. For that specific tag, the buck only needs to have one visible antler, a nub as my husband called it. To be perfectly honest, I was willing to shoot just that. It was a little after 5 p.m. on opening day, my husband Ty and I had been seeing does for about an hour. We’d been watching their behavior all day and they seemed to be migrating through this one area. In the morning, the deer came down from the rim rock into the valley, then around 4 p.m. we noticed that they seemed to be moving back to higher ground. That’s when we came to a gravel road that we knew headed up to the top of the rim. I said, “Let’s take this road one more time.” My thoughts were maybe we would get lucky and see a little buck when we got to the top. Ty and I were riding along in near silence, eating sunflower seeds and enjoying the beauty of the landscape. We had just passed the first bend in the road, when I looked up through the ponderosa pine trees and all I could see was a massive rack walking up the hillside. “Big buck, big buck, big buck,” I repeated in a low whisper as I tapped my husbands arm. He stopped the truck and I jumped out, loaded a bullet into the chamber, ran up the hill and ducked down behind a tree on one knee. The buck had realized something was going on at this time and had stopped, quartered away from me about 80 yards away. Some of his body was hidden by trees and brush, but I could see his big rack, and the front half of his body. I looked through my rifle scope to make sure I had a clear shot. And, to my total disbelief I did. I was so focused on the task at hand, I didn’t even respond. The buck had been looking at me for what felt like forever. It was now or never I thought to myself. That’s when I fired a single shot from my .270. The two bucks and the doe ran left, traversing the hillside, with my buck several yards behind the other two. My thoughts are racing, did I shoot him? Wow, he’s magnificent. Oh no! Did I miss? That’s when he jumped a downed log and started to stumble. He went down hard and fast about 30 yards from where I shot him. “I got him! I got him!” I shouted as adrenaline pulsed through my veins. Ty was so focused on the other buck, who would later receive the nickname Blondie because of his light colored face and horns, he didn’t see the big buck go down. “No you didn’t hon. That buck is long gone,” he said. We started running the 80 to 100 yard trek up the side of the hill, all the while I was trying to convince my husband there were two bucks. It was the longest moments of my life. It felt like the world was going by in slow motion. My thoughts were racing, I couldn’t see the buck, maybe I didn’t get him. As we got within 40 feet I was overwhelmed with relief and disbelief. On the other side of a giant log laid a huge 4×3 with an enormous body. My husband’s face lit up like a child on Christmas morning. With a high five and a huge hug, my dream was realized. Three days later my husband shot Blondie on the top of that same rim. It’s a trip I will always hold near and dear to my heart. Not only did I accomplish a life-long goal, but I did so with the love of my life and my best friend by my side, making it all the more special. Now, the size of the buck didn’t matter to me. Don’t get me wrong, I’ve shared my story with all who would listen. But, what matters most is the moments in your life and who you share them with. For me that will always be my family.